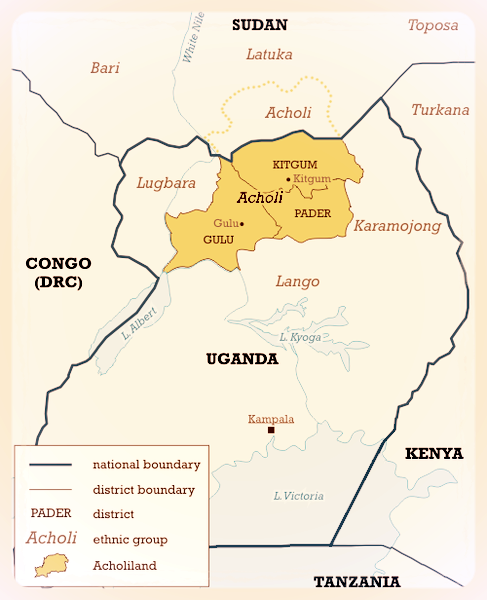 In the 1990s and 2000s, the Acholi people of northern Uganda (along the South Sudan border) were attacked by rebel Lord's Resistance Army led by Joseph Kony. This rebel army was responsible for the murders of hundreds of thousands from northern Uganda, South Sudan, and the Congo. He also recruited nearly 70,000 child soldiers during his years of terror. Fortunately, Kony has been exiled from Uganda and has not been seen for nearly a decade. Many of the survivors of these attacks had to witness or participate in the death of their family members in order to evade death themselves. Once forced into the rebel armies, they often had to endure physical and sexual torture before either suffering death or somehow escaping to their freedom. The stories of some of the survivors must be read to fully understand the horrors that were endured. Those who were able to successfully flee to the capital city of Kampala gathered on some public ground and formed a makeshift refugee camp that eventually became their fragile and meager way of life. Here at the Banda Acholi Quarters they live in small mud huts and subsist in densely populated quarters, just barely surviving daily life. Now, after about 20 years in this location, the city of Kampala has decided to reclaim and repurpose this public ground to make room for new governmental housing. The 3000 Acholis that Kids Inspiring Kids has cared for over the past several years are now facing a life threatening challenge, with instant homelessness, disorganization, and famine expected to result from the demolition. Dozens, and likely hundreds, of these resilient Acholis are expected to die from the transition if we do not help create them a place of refuge. This is why is to so critical that the Place of Refuge Village dream is turned into a reality. Kids Inspiring Kids faithfully believes it can provide the spiritual, physical, and financial resources necessary to build this special group of survivors a new self-sustaining and enduring village they can call home. You can help deliver this life-saving project through your prayers, volunteerism, and philanthropy.